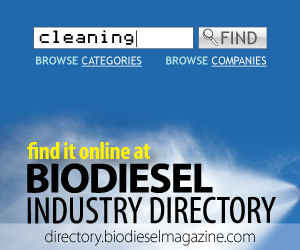 Biofuel Weiss Inc. is developing a 7 MMgy biodiesel plant in Halifax, Nova Scotia, Canada. Planned for startup late this year, CEO Ian Weiss tells Biodiesel Magazine that the company's business plan is based on 100 percent export to Germany. Under the 12-month contract, which went in to effect in March, Renewable Energy Group is purchasing raw materials for Iowa Renewable Energy's 30 MMgy multifeedstock plant in Washington, Iowa, and marketing biodiesel produced at the facility. A partnership between U.S. soybean farmers and the National Tractor Pullers Association will reach a milestone May 17 as B100 will be allowed in all diesel pulling classes for this season. B100 can provide 4 percent more torque and horsepower. BioFuel Aruba plans to expand its biodiesel production capacity as early as Q3. BioFuel Aruba also entered into pilot agreements with the Aruba Airports Authority and the public transit company Arubus to implement a biodiesel blend into their fleets. Intertek announced it has been granted BQ-9000 certification by the NBAC. The Intertek biofuels laboratory in Romeoville, Ill., is listed as a testing facility on the BQ-9000 website and is a preferred lab for BQ-9000 producers and marketers. The Iowa Renewable Fuels Association announced that Iowa's biodiesel plants operated at 54 percent capacity in the first quarter of 2013, producing nearly 43 million gallons. Nine of the state's 12 biodiesel plants reported production. Laramie, Wyo.-based PlanktOMICS Algae Bioservices recently finalized a spin-out agreement with the University of Wyoming. The company has developed a service business that expedites the highly technical process of domesticating algae. During a call to discuss its first quarter financial results, Syntroleum Corp. announced that Dynamic Fuels LLC's renewable diesel plant in Geismar, La., is expected to resume operations in July. The 75 MMgy facility was idled in late 2012.